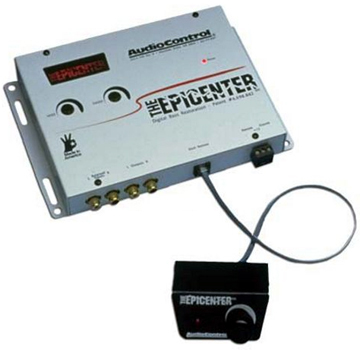 An "EPICENTER" is a small electronic stereo box that takes music and adds the "lost" bass frequencys in all recorded media, like CD's and mp3. It also adds the sub harmonic spectrum of whatever sound is put into it. The amount of bass sub harmonics you want to add is controled by a sub harmonic "volume" control. "Click here for other bass products;"
There is 1 problem with the epicenter though. the ULTRA VIBRATION 20 to 40 HZ bass, and the "WINDY" bass at 10 to 20 HZ. We know that ear doctors and engineers that dont understand high Sound pressure Level say you cant even hear bass below 20 hz; well us "BASSHEADS" know there wrong. I hear(or feel) 10 HZ everyday in my car stereo off rap cd's, britney spears, rock, even radio, of course jungle and rave music. If you want to enjoy the fierce superdeep bass in the under 40 hz range then you need a frequency chip. These frequency chips provide you with the "scary bass" you have been looking for. Get 1 or 2 more octaves of deeper musical bass. Don't just settle for bass when you can have a little "wind". You need to have a air tight sealed box or retune or just make sure your vent tuning is lower than about 25 HZ. We like to tune between 24 HZ and 18 HZ and the bigger box the better. If you already own a box you can stuff the vent with a fat towel of you can lengthen the port to maybe 2 times the normal length, or if you got 2 ports block 1 of them. But in order to hear that freaky windy bass you need a chip. And you need really good loudspeaker subwoofers like; OURS, RE, ALPINE TYPE X, MMATS, MEMPHIS, ADIRE, CERWIN VEGA,JLW7, DIGITAL DESIGNS, TREO, ORION H2s, JBL GTi,, MTX THUNDER 9500's, ... you know the good stuff, because your woofers will MOVE!!!!!! A non top of the line woofer may over pump and over excursion (bottom out), and possibly die. We have chips from 10 hz to 32 HZ, we recommend try around the 20 HZ first. Then if your woofers can handle it try the the 10 HZ. That should be enough, but if you want to go pyscho then upgrade to the 10 HZ and rotate the knob all the way, if your woofers can handle it. We can also figure it out which frequency chip is best for you.Just call or email and tell us your woofer brand and amplifier power and box /port size. The chips are $20 each for every frequency you select. plus $4 USA shipping. The sound comparison is like this: A car stereo system without an epicenter compared to 1 with an epicenter is like a car system with an epicenter compared to 1 which has a "BASS CHIP". When we change it back to the epicenter factory 32 HZ chip it sounds sad and weak. Installation is very simple and takes about 5 minutes, just pop out the factory chip and pop in the frequency chip. We give you the instructions. You dont need to know electronics or anything, no solder is even needed! The frequency chips do NOT increase your db level.They increase your FUN level. Basically every speaker in the world loses db the lower in frequency you go, so this is a daily driving or S.Q.L. sound QUALITY chip not a sound PRESSURE chip.